SAE Sockets: 5/32", 3/16", 7/32", 1/4", 9/32", 5/16", 11/32", 3/8", 7/16"
SAE Sockets: 3/8", 7/16", 1/2", 9/16", 5/8", 3/4"
SAE: 3/8", 7/16", 1/2", 9/16", 5/8"
Hex SAE: 3/32", 1/8", 5/32", 3/16", 1/4"
SAE: 1/16", 5/64", 3/32", 1/8", 5/32", 3/16", 7/32", 1/4"
To do the job right, you need the right tools! JEGS has tool sets to build, maintain, and customize everything in your garage. These high-quality sets are a great addition to any tool box, and tough enough for any race track. Get the tools you need & the results you want with JEGS! 80427 is rated 3.9 out of 5 by 15. Rated 5 out of 5 by saddle1 from tools for the classic car on the road. I haven't used them yet.they are for the trunk of my classic car. if I need them on the road. great set of tools. Rated 5 out of 5 by Dee777 from LOVE IT!! I bought this a little while ago for my son because I bought myself a different one a month before. After seeing it, I wanted so badly to switch them and give him mine instead!!! Lol... This one was about the same price and so much nicer!!!! You can't go wrong with this one!!! You'll LOVE it!!!! Rated 5 out of 5 by Mary Mechanic from Great starter set One of the youngsters I baby sat is now 15 and wanting to make money. He helps out here and does a nice job. Imagine a 15 year old able to put his cell phone down and work for two hours. I rewarded him with this set for his help as he is considering appliance scrap metal to augment his income. It's a nice set and will last through him. Having a place for everything a plus. Rated 5 out of 5 by Suitcase from Tool kit for truck. 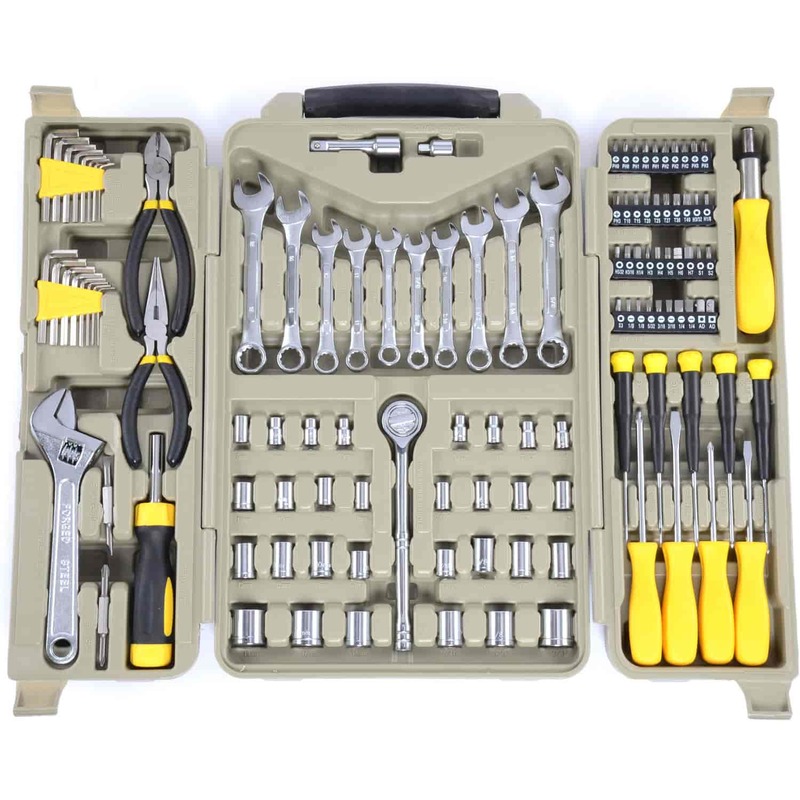 I was looking for a simple non-expensive tool kit for my truck. I had seen this one at Jegs in their catalog. I waited for it to go on sale to buy it. It's a perfect size tool kit for my truck. I slide it under the driver seat. The kit contains SAE and Metric sizes sockets and wrenches, just what you need for a GMC truck since they have both metric and sae bolts and nuts. The wrenches aren't the best quality but will do in a break down. Over all I am very happy with this kit. Rated 5 out of 5 by Bill smith from Product works fine for me Bought to keep around the house for projects, tools work as they should. have not tried using on car repairs yet. Rated 4 out of 5 by SC360Hornet from Basic Tool Set - Good Value for Price I bought this kit to keep in the trunk of my drag car that I occasionally drive on the street...For emergency repairs. Kit has all the basic stuff for basic repairs. These are obviously not Snap-On quality tools, but will do just fine if you're stranded and need basic hand tools to make repairs. All tools are packed tightly in a plastic, hinged case...So there are no rattles or squeaks or loose tools making noise. Rated 3 out of 5 by JP4270 from Decent tools, shoddy case. As others said, the case doesn't hold all the tools snuggly. I bought this to be my wife's tool set. I've since used it for several roadside repairs. The quality is fine for the money, and usually I've had what I needed.